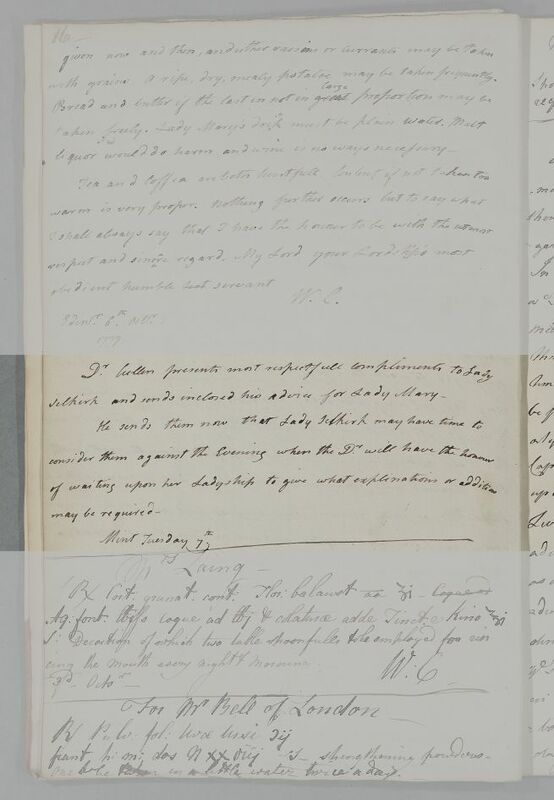 Reply, in the form of an untitled transcript of a short cover-note to Lady Selkirk describing enclosed advice for Lady Mary. Summary Reply, in the form of an untitled transcript of a short cover-note to Lady Selkirk describing enclosed advice for Lady Mary. Case of Lady Mary Douglas diagnosed with a 'weakness of her bowels'. Selkirk and sends inclosed his advice for Lady Mary. 1: Cullen's house at Mint Close bordered the garden of the Selkirk's Edinburgh town-house. He was, in effect, their neighbour. This case-book entry suggests he wanted to keep a record of a short note that had probably been hand-delivered by a servant.